We have seen that the momentum behind the AGO/Vinci and government project has seriously slowed down on the ground over the last month or so. Strengthened by progress made over the last few months, ACIPA and coordinated bodies of opponents plan to put the pressure on decision makers by organizing the now traditional Summer festival this year on an unrivalled scale. The two bodies above invite support committees to disseminate the information available as widely as possible and mobilize them for the NDL 2013 gathering just as they did the day after the police invasion of 16 October at the ZAD (ZAD means "area to be defended" [Zone À Défendre] to opponents but "development area" to developers). Our success will come from the extraordinary and innovative ground swell movement they have set into motion. Even so, the airport project has not been definitively halted ! The time has come – now - to wrest victory ! It can be done. The project promoters have pig-headedly gone off-track and found themselves in a major political setback, both for reasons relating to their insistent ZAD demands (expulsions, house destruction, aggressive police behaviour, etc.) and for their repeated lies and their displayed contempt for the conclusions of the three committees, especially those of the Scientific Committee! The weekend of 3 and 4 August will be festive and militant. Thought with a strong potential for action - to innovate, to draw up alternatives, etc. 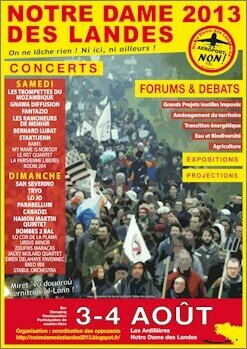 Festive: after the work groups representing elected regional / local representatives, pilots, surveyors, members of the legal profession and naturalists, it will be the turn of musical artists to entertain us as part of the battle of Notre Dame des Landes. More than 30 groups playing all kinds of music will participate in the Summer 2013 event. Children will not be forgotten: playspaces will be laid out for them and children's shows will be put on. The Notre Dame des Landes 2013 gathering will be THE inescapable gathering of the Summer for the defence of threatened land and farming jobs, for better use of taxpayers' money and to halt projects as useless as they are destructive, here as elsewhere! But inescapable also as a means of inventing and implementing together those alternatives that are indispensable: in favour of energy transition, tackling climate change and a return to solid civic rights that have been confiscated from us by the governing political parties. VICTORY BELLS COULD RING OUT SOON ! LET’S KEEP THE PRESSURE ON! HERE AND ELSEWHERE ! Mid January 2013, Bellevue farm was saved from destruction by the COPAIN ("Committee of Professional Farming Associations against the airport project" but "copain" in French also means "friend") and cultivated once more. Mid-April marked the Séme (Sowing) operation of the ZAD when permanent facilities, mainly smallholdings, were installed. 11 May, almost 40,000 people formed a human chain around the area to protect it by burying the project into oblivion! Late January 2013 : the supreme court of appeal rejected the request made by AGO/Vinci to accelerate a decision from the appeal court following the failed expulsion ruling with the result that the expulsion of inhabitants and the farming community involved was postponed. the agricultural commission confirms our figures in respect of the wastage of farming land and re-assures the farming community under threat of expulsion: they can continue to farm their land and live decently at least until the end of the year ! the scientific expertise commission does not validate the AGO/Vinci and government proposals put forward within the framework of the "Water Law" public inquiry: the whole environment compensations file has to be reviewed! The immediate effect of all this is to halt preventive archaeological excavations, halt expulsions, halt demolition of buildings and proceed with the withdrawal of the police force from the area. Complementary environmental inquires shall be undertaken. Strengthened by the support we have received, we are monitoring the progress of the file calmly and determinedly, especially in respect of European instances, which could apply pressure on French decision makers. A successful gathering will quite naturally increase the pressure. HOPE IS NOW NO LONGER A VAIN WORD !